The University of North Carolina at Chapel Hill is named the playing floor at the Dean E. Smith Center for head men’s basketball coach Roy Williams, who has led the Tar Heels to NCAA championships in 2005, 2009 and 2017. The night Roy Williams came back to Carolina, fans ran alongside his car like he was a member of a boy band. 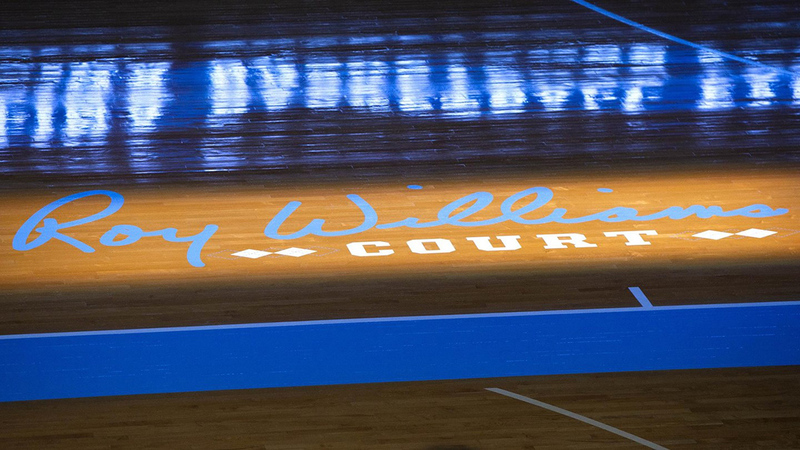 For some reason, that memory came to mind on Friday night as Williams stood in front of 300 Tar Heel basketball lettermen in the Smith Center. That night the coach came back, April 14, 2003, we were excited. Still, it seemed a little overzealous to run beside his car as he pulled into the Smith Center, shouting, “Roy!” and pumping a fist. But if we’d had any idea how incredibly good it would be, that just 15 years and three championships later the program would gather in the Smith Center and two of Williams’ grandkids would pull the tarp unveiling his name painted on the court, all of us would have been running and shrieking. The weekend was a reunion long before it was a court-naming. Since Williams became head coach, the Tar Heels have had reunions largely around home basketball games, and also during the season-long 100th year of Carolina basketball celebration. This one, however, he wanted to purely be fun. Maybe, you might speculate, the coach has realized as he’s gotten comfortable in the grandfather role that the parts of the year that don’t contain basketball season can also be productive. For whatever reason, the program came together on a nondescript August weekend. It began on Friday morning with golf at UNC Finley, where, as Williams was quick to note, he may have defeated a certain former national champion Tar Heel point guard. Sorry, that doesn’t narrow it down that much, does it? OK, it was Bobby Frasor. Friday evening, the concourse of the Smith Center was rendered almost unrecognizable by the planning team of Eric Hoots, Sean May, Kaye Chase, Tony Tucker and Josh Reavis. The walkway was a Carolina basketball fantasy. Over here was Marvin Williams introducing himself to Joe Quigg, who made the title-clinching free throws in 1957. There’s Antawn Jamison! I think I just saw Ranzino Smith walk by! Did you know Brice Johnson is here? Remember what Williams tells his current team at every one of these events: Don’t be cool. Don’t be too caught up in Instagram to stop and listen when Melvin Scott is telling that story about the Villanova game in 2005, or don’t forget to ask Ademola Okulaja for his number, or don’t be ashamed to listen if Matt Doherty and Jimmy Black are talking about whether that 1982 team really was the best of the Tar Heel national championship teams. By the time everyone assembled in sections 124-127 of the Smith Center for the night’s speakers, it had already been a memorable evening. It only got better when Jones Angell began the program. The headlining event was the official unveiling of Roy Williams Court, but the night’s speakers made it even better. Bubba Cunningham pointed out that Williams and his wife, Wanda, have given Rams Club donations to every single sport on campus. As you’d expect with family, of course, they don’t just lionize you. They also can rib you a little, as when Board of Trustees member and former basketball manager Chuck Duckett recounted the time Williams tried to order a chicken biscuit from a famous Chapel Hill institution while working as a Carolina Basketball School camp director in the late 1970s. The line was busy. The crowd roared, and Williams grinned, carefully patting the dozens of timeouts he’s stored away during his 15 seasons as Carolina’s head coach. And then a couple minutes later, he was crying, and that type of emotional swing tells you it’s been a very full day. Remember, Dean Smith once told Davis he probably shouldn’t expect to play very much if he committed to Carolina. Marvin Williams also spoke without notes, taking the crowd back to the night Roy Williams made an in-home visit in Bremerton, Washington and left Marvin’s mother immediately knowing she wanted her son to play for Carolina. Marvin Williams, of course, was so committed to fulfilling his degree requirements, he returned to take summer school classes every offseason for seven years. Roy Williams’ son, Scott Williams, provided the perfect mix of family insight and self-deprecating humor. And then it was Roy Williams’ turn at the podium, and the tears were coming again. One of the lasting images from the evening will be Williams, staring straight ahead while making his speech, while Hubert Davis sits in the first row of the crowd just to Williams’ right. Davis was also staring straight ahead, not looking at the head coach, because both men were afraid they were going to break down if they glanced at the other. Think back to 1986. Dean Smith was adamant this building would not be named for him. It was called the “Student Activities Center” right up until dedication day, and it was only once Smith’s confidantes persuaded him that putting his name on the building was the only suitable way to honor his hundreds of players—the “WenstromReidDaughertyKupchakandMore Center” not really having a great ring to it—that he acquiesced. Let the record show that Williams had similar misgivings, even as recently as this morning, when he gathered his staff to once more reemphasize that this was supposed to be a reunion weekend, not an Honor Roy Williams weekend. And there were plenty of time for reunions. For a few minutes, though, there was time to honor Williams, with the blessing of Smith’s family, many of whom were in attendance. Williams’ words on Friday night sounded very much like those of another Tar Heel basketball coach, one whose name also adorns a prominent piece of the building. “I hope the last day I coach and the last breath I have is thanking my players,” Williams said. He told the crowd that watching two of his grandsons pull the tarp to reveal his name on the court a few minutes earlier had been “the neatest thing I’ve ever had happen.” And before he took the microphone to sing happy birthday to his newly seven-year-old grandson, Court—he roped in Angell and Davis to join him at the mic—he reminded everyone why they’d assembled in Chapel Hill on this evening.